Turn Century Turn is an interesting new compilation featuring spacerock and psych bands from the USA and various Scandinavian countries, one British band, and one Turkish entry. The focus is heavy on bands known for their experimental and/or improvisational skills and some entries seem to be part of a spacerock avant garde. In any event, the results are quite fascinating and all tracks are non-album releases. On the trippier psychedelic side are Chameleon and Holy River Family Band from Sweden. Chameleon features gorgeous mindbending guitar driven psychedelia from Holy River Family Band's (HRFB) Arne Jonasson. The music is similar to HRFB but this is Arne's show rather than sharing the stage with keyboardist Jens Unosson. This is a great exploratory instrumental track in which Arne's guitar travels the astral planes and kindly takes the listener along with him. HRFB's entry is among the most cosmic of spacerock. The Chameleon tune is a treat but Arne's guitar really shines best in its marriage to Jens' organ and synths. Arne carries the main melody while Jens' organ does so in a secondary role. The song trips along for a while but then gets aggressively cosmic and slightly jazzy, reminding me of some theme to a spaced out film noir. Turkish band Zen is one I'd not heard before, but has a jamming Cream-like feel though strongly rooted in Middle Eastern sounding psych. A pleasant journey that I think a lot of psych fans will dig, but I didn't feel driven to seek out more from them. Turn Century Turn also has its share of American spacerock veterans. Milwaukee's F/i does "Space Station", which must be the first new track from them since their "Helioscopium" CD. Helioscopium's heavy rockin' guitars are absent with this being a totally cosmic electronic piece more reminiscent of earlier F/i. But it's still a pounding steamroller of a track with a slightly new wavish edge. The song features multiple layers of space synths which trip and soar in every direction at once against a drugged but almost danceable techno beat. Great stuff from these spacerock veterans. Long time New York spacers, Alien Planetscapes, crank out "Prince Chubbs", a tune I've heard live at the last two Strange Daze festivals. Alien Planetscapes excels at rocking very hard in space, but in a non-metallic way. "Prince Chubbs" is a great example of Alien Planetscapes's blazing guitars, swirling synths, and rockin' rhythm section that threaten to demolish the ozone layer once and for all. New guitarist Josh Gazes has a much more psychedelic edge than Rob Alfonso did and this was immediately apparent in the bands' Strange Daze performance in August. The song also features the jamming mid-70's King Crimson 'launched into space' influence that Alien Planetscapes does so well. Somewhat similar to Alien Planetscapes is Norway's Tangle Edge. Aggressive guitar crunches against a cosmic flowing synth backdrop, and has what is probably the best percussion work on this whole disc. Actually it's more of an early 90's version of Alien Planetscapes that I'm thinking of with this comparison. Tangle Edge has the same jazzy improvised feel and ability for each member to jam along seemingly in his own little universe, yet all still working together to create a cohesive whole. And also like Alien Planetscape's track earlier this is somewhat like a spacerock version of mid-70's King Crimson. New York's Escapade offers their brand of improvisational spacerock with lots of subtle synth work and atmospherics. The tune gets quietly aggressive at times with a shimmering psych guitar that sounds like it's in the early stages of a meltdown. All this is played against a very heavy bass sound with a funky edge. Best enjoyed with headphones. Two Norwegian bands I'd been unfamiliar with are Chateau De Fleurs and Tibra Komal. Chateau De Fleurs is a dark atmospheric band that makes great use of freaky synth sounds, dissonant piano lines, and quirky rhythms. At under three minutes though it's one of the shorter tracks here but I'd be interested in hearing more from this band. Tibra Komal's "Oriental Orchid Spinned Of A Silkworm" is an aptly titled Eastern psych tune. Lots of varied percussion work and eerie efx'd vocals create a tripped out atmosphere, but once again this is a tune that was too short to give enough of an idea about the band but left me interested in seeking out more. Getting into more avant experimental freakout territory is Finland's Ektroverde, an offshoot of the band Circle that has been reviewed several times in AI. Their contribution features repetitive and somewhat dissonant bass and guitar lines accompanied by more floating synth and flute to make an interesting contrast. Another band that I'd not previously been familiar with was England's Volcano The Bear. Volcano The Bear would likely appeal to Ektroverde fans though Volcano The Bear is far more aggressive and grating on the ears in a creatively sonic way. The band uses noise to its full effect producing soundscape music that seeks to unsettle rather than relax. I found an article about them on the internet in which they claim the Residents as a strong influence. This is apparent on this tune though there's far more here for spacerock fans than The Residents typically offer. Definitely a band I want to find out more about. Even more like a spacerock version of The Residents is Iron Bong from the USA. A wild and quirky electronic band, Iron Bong takes slowly developing patterns and overlays them with mega freaky bleeps and blurps. Part floating electronica and part 'everywhere at once' electro madness, the combination produces an interesting effect and its position is well outside the Earth's atmosphere. A pleasant surprise for me was the entry by Beyondomatic who you may have read about in AI #6. "Family Chi" is far freakier than the Beyondos featured on last year's "Your Body" CD. A bit industrial, a tad out there jazzy due to the clarinet, and... Rev. Fuhry's Long Stiff Finger Of Doom! All this is encased in Stenzo's synth noodlings and some pretty twisted vocals. In summary, this is an excellent compilation that covers the more experimental and adventurous side of spacerock and all things FREAKY!. A good chance to sample some of those bands you've read about in AI as well as discovering some new ones. 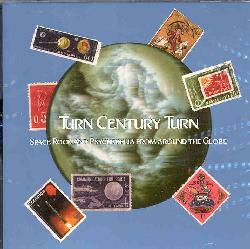 Turn Century Turn is available through Mother West Records.